Aside from painters, such as Hopper featured in an earlier blog posting, many photographers have influenced my work as well. Documentary black and white photography by people such as Lewis Hine and Margaret Bourke-White had a major influence on the types of subjects I like to look for and photograph. 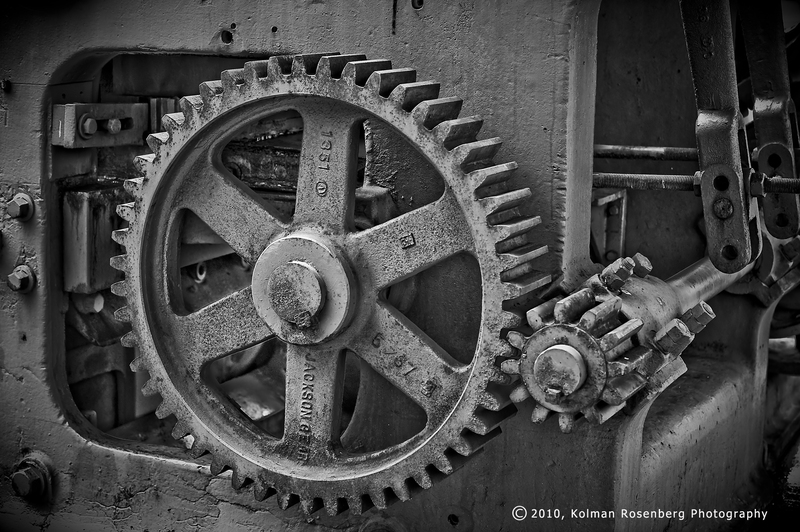 I often venture into industrial areas, seaports, rail yards, and any other areas where I can find industrial machinery, modern or rusting, looking for interesting detail shots of the machines and sometimes the people working with the machines. This photos focuses in on the workings of part of a steel mill. This machine is on display at Station Square in Pittsburgh, PA and reminds visitors of the steel-making history so embedded in that area. This entry was posted in Uncategorized and tagged lewis hine, machinery, margaret bourke-white, mill, pennsylvania, pittsburgh, rust, station square, steel. Bookmark the permalink.